The Pulsaderm Brush was launched at Cosmoprof North America just last year and represents the next generation in skin cleansing technology. Its brushes work at multiple speeds to keep all your pores well massaged and clean. This year they went a step further and introduced the even more convenient Pulsaderm Buddy to their roster of fantastic skin care products. Both the Pulsaderm Brush and the Pulsaderm Buddy use proprietary SONIC movement technology to provide pulsation cleaning power beyond what an ordinary brush would offer. While the German designed concave brush gets into all the hard to reach areas on your face, neck and décolleté, it's the micro pulsing SONIC movement that cleanses your pores of dirt and makeup without damaging your skin. The brush is even designed to work in tandem with your own favorite facial cleansing product as the movement increases absorption. It's a gentler way to cleanse your pores and leave your skin smooth and supple. The Pulsaderm Brush offers three great speeds (regular, sensitive and body) and a charging base, making it great for home use. But, for those with more hectic lives, the Pulsaderm Buddy is a perfect fit. The Buddy fits in the palm of your hand and is easy to control with one simple button. 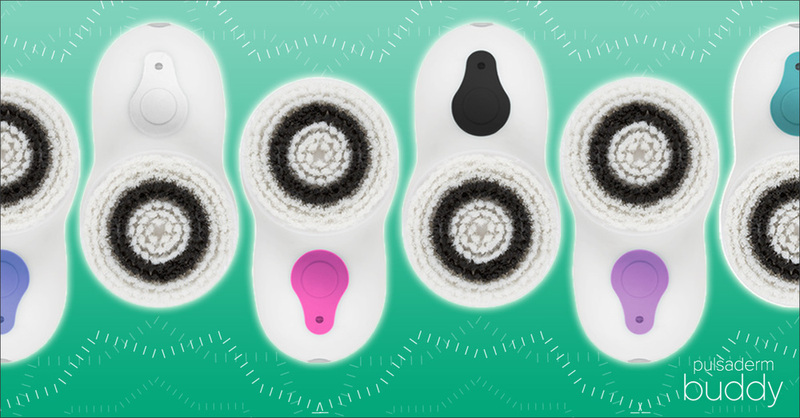 It has two speeds (regular and sensitive) and comes with two interchangeable brush heads (sensitive and normal). So, when your skin changes with the weather, or if the skin on your forehead needs a stronger clean than your décolleté, you'll be able to easily adapt your Pulsaderm Buddy to fit all of your skin needs. In addition, the Pulsaderm Buddy conveniently comes with both an AC Adapter and a USB attachment, making charging easy and packing cords and chargers for travel a breeze. In addition the Buddy comes with its own cosmetic bag for storage and travel. This way you can easily get ready for a night out after a long day at work, cleanse your skin right after hitting the gym so your pores don't clog, or bring it along any time you travel. It's small enough to use even in an airplane bathroom so you can keep your skin clean on a long, pore-clogging and stressful flight. The Pulsaderm Buddy is a great option for those who have busy lives but still want clean and smooth feeling skin. It even comes in 6 bright colors (pink, purple, blue, turquoise, white and black) to match your gym bag, cosmetics case, or simply your mood! All you need is some cleanser and water and the hand-held buddy will keep your face feeling well taken care of no matter where you are.